“Rakkhosh” is a 1st complete POV film from India where the camera is the hero. The story of “Rakkhosh” is set in a mental asylum and is shot from 1st person POV of a schizophrenic person. It recently screened in front of a full house audience at Pune International Film Festival (PIFF) 2019 and won Special Jury award for Best Director at Rajasthan International Film Festival (RIFF) 2019. It is also scheduled to screen at Orange City International Film Festival (OCIFF) 2019 at Nagpur. Team RAKKHOSH, consisting of Producer Sayali Deshpande, Creative Producer Prashen Kyawal, Writer and Director Srivinay Salian, Actors Ashwath Bhatt, Sonamoni Jayant, were part of the award-winning team. Sayali Deshpande accepted the award on behalf of the directors. 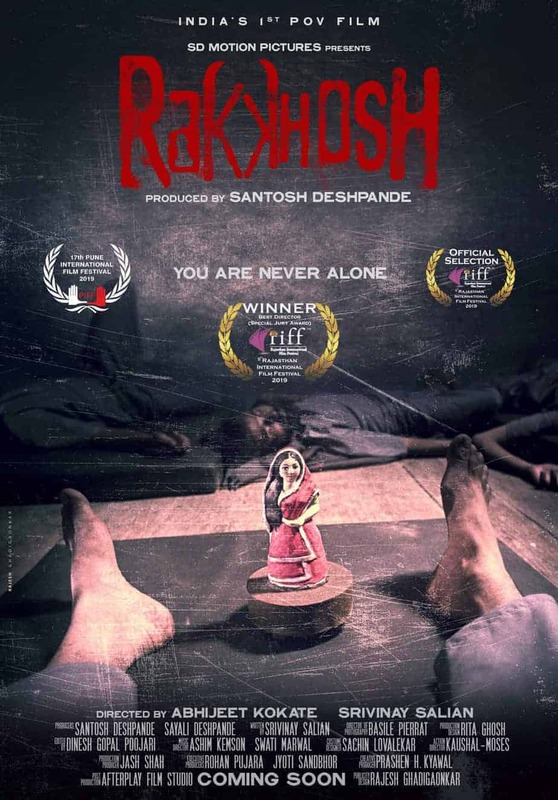 “Rakkhosh” is based on a story written by the late Mr. Narayan Dharap whose other two stories released on 2018 were the basis for the acclaimed film “Tumbbad”. Srivinay Salian who was then supposed to be just the writer for the film, got a narration of this story called Patient No 302, by Narayan ‘Tummbbad’ Dharap, and was asked to write it. “I didn’t want to read the story and I said that I would write it first and if they didn’t like it, I would then read the book and modify my script. Thankfully, they liked the story,” says Salian who has co-directed the film along with Abhijit Kokate. “Rakkhosh” is produced by Santosh Deshpande and Sayali Deshande under their production house SD Motion Pictures Pvt Ltd. It is Sanjay Mishra, Priyanka Bose, Tannishtha Chatterjee among others. It is helmed by Prashen H. Kyawal as the Creative Producer and Dinesh Poojari as the film editor. Prashen H. Kyawal is a digital generation pioneer who started in MultiMedia industry in 1992, shifting to Web in 1999, turning into a film critic in 2007 and following it up as film journalist since 2010 onwards to finally work as a filmmaker in Indian film industry, operating out of Mumbai. He's passionate about cinema, music, media, food, fun, friends, travel, gadgets and everything which spells high quality and elite lifestyle.